While I was keeping my Hollywood Journal, I tried to take photos to document some of the changes that were occurring. 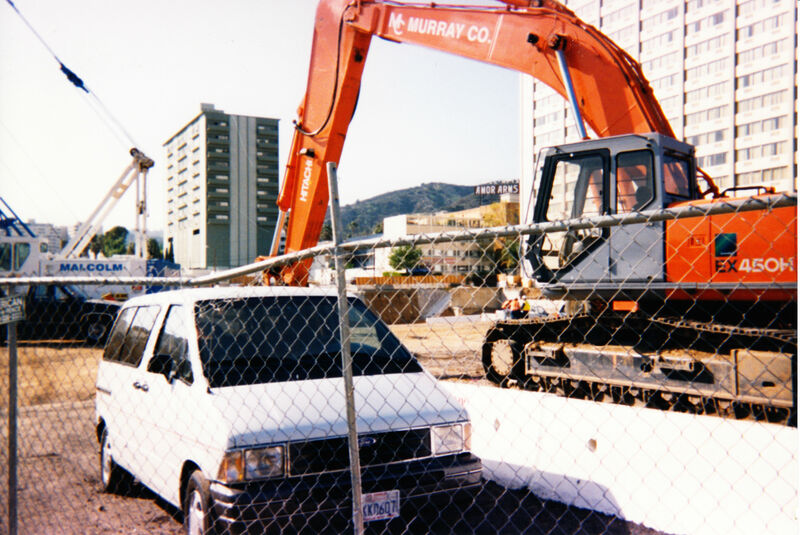 These were taken while the Hollywood & Highland Center was being constructed, and they sort of go along with the first entry I wrote (Hollywood Journal – Intro). Sorry the quality isn’t better. I’m not a great photographer, and these were taken with a disposable camera. It’s important to remember that Hollywood & Highland was being built as the same time as the Red Line was under construction below Hollywood Boulevard. Because one of the subway stops is built into the complex, the two projects had to be done concurrently. It was a crazy time, because the construction of that stretch of the Red Line was a mess. Hollywood Boulevard sank six inches, in part because the contractor was was not following proper procedures during tunneling. It was reported that they were using telephone books instead of metal wedges to prop up the supports. Construction site on Hollywood Boulevard. A different angle on the site. 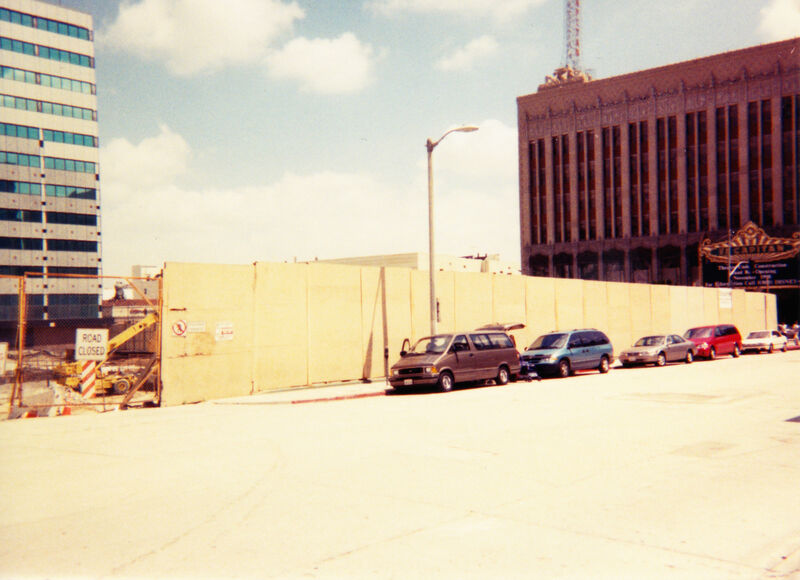 Above are two views of the construction site from Hollywood Boulevard. 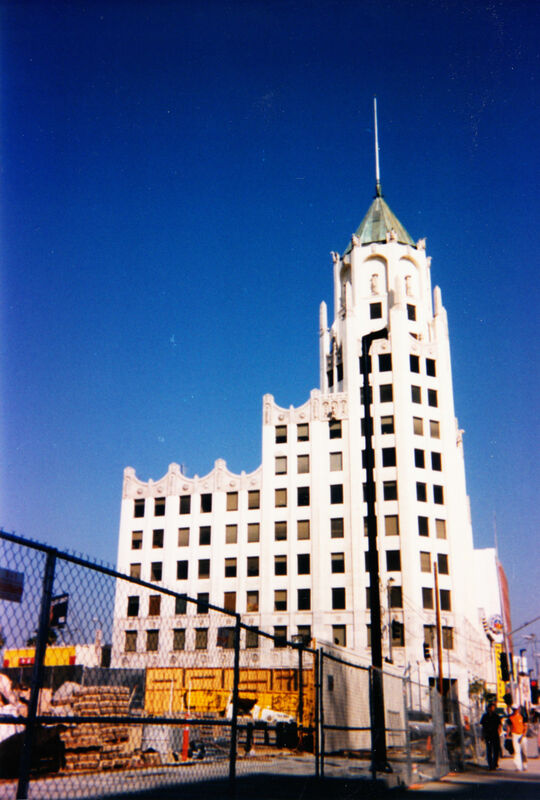 In both you can see part of the office building that used to stand on the northwest corner of Hollywood and Highland. 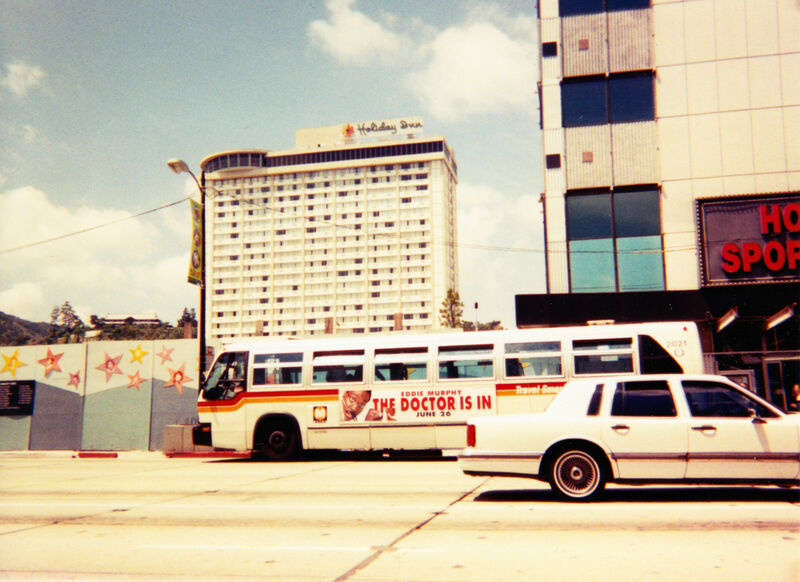 Also, in the background you can see the former Holiday Inn, which is now Loews Hollywood Hotel. Those familiar with the area will notice that in those days it didn’t have the facade which was added back when it was known as the Renaissance. Looking down Orchid to the El Capitan. This is a shot of the El Capitan from Orchid. 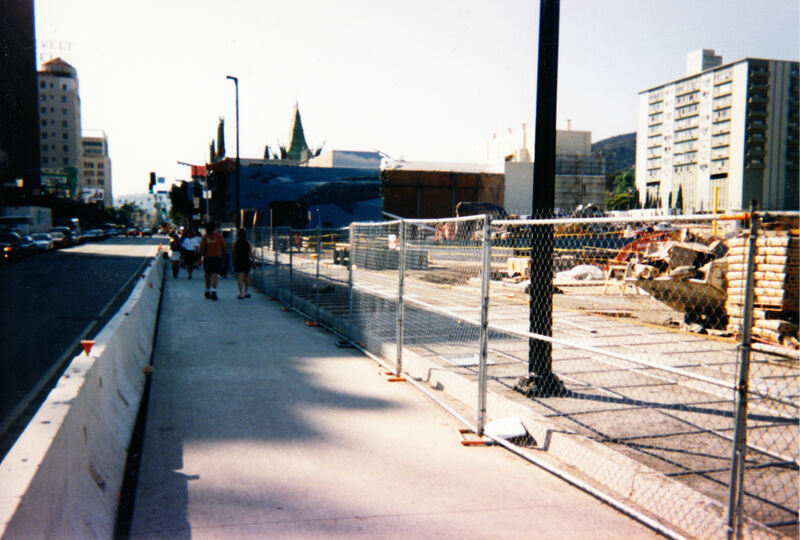 This part of the street no longer exists, since it was closed off in order to construct Hollywood & Highland. You can still enter Orchid from the north on Franklin, but it no longer continues through to Hollywood Boulevard. 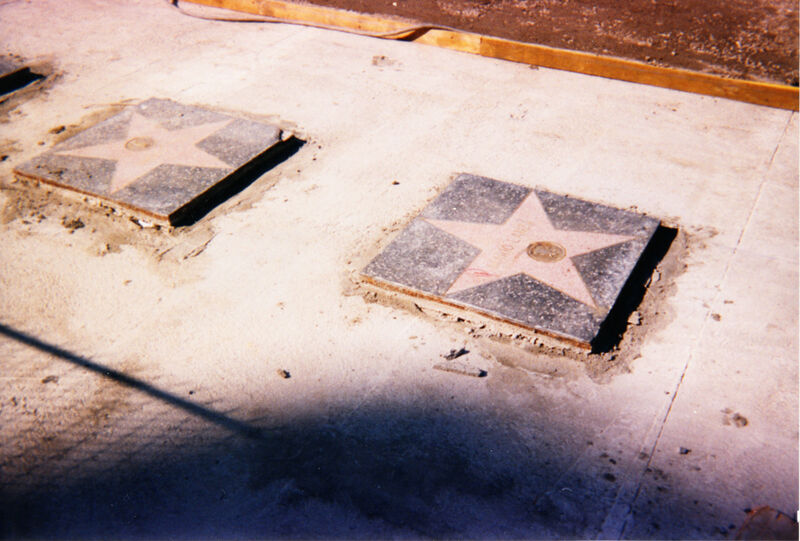 The Walk of Fame during construction. The stars on the sidewalk in front of the project were removed during construction, and then replaced when the project was finished. Looking west on Hollywood Boulevard. Above is a shot looking west. It’s too bad the image isn’t very sharp, but you can see the remnants of a cool mural depicting whales in the ocean. It was painted on the side of the Chinese Theatres. Also, in the distance, you can see the Roosevelt Hotel. The construction site, again facing west. Another shot of the construction site facing west. The First National Building stands alone against the sky. 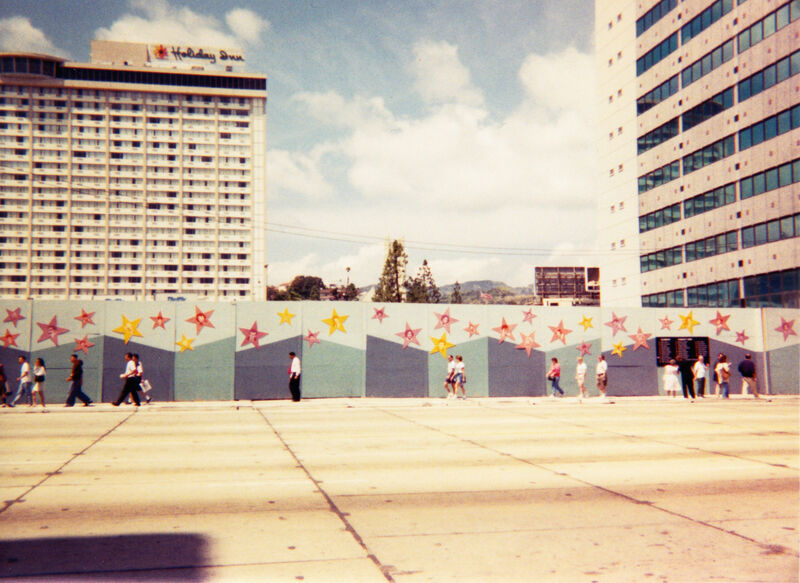 In the first two photos above you can see the office building that used to stand on the northwest corner of Hollywood and Highland. It had to be demolished to make way for the new mall, and I remember how its disappearance created this amazing sense of space. Before the new structure rose up, you had a mostly unobstructed view of the hills. And for a while the First National Building, which still stands today, seemed to tower over everything. Looking across the construction site towards the El Capitan. Another view of the construction site, looking towards the El Capitan. 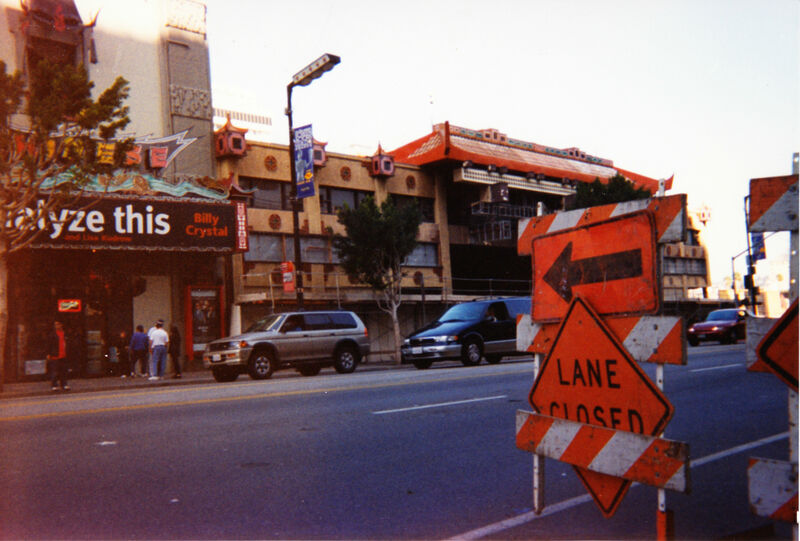 Next to the Chinese Theatre, you can see the Chinese Two and Three, not long before demolition. During the eighties movie exhibitors began building multiplexes instead of stand-alone theatres. In order to compete, the company that owned the Chinese built two more auditoriums right next door, the Chinese Two and Three. They didn’t look like much from the outside, but they both offered large screens and excellent sound. When Hollywood & Highland was built these two theatres were demolished, and were replaced with six more inside the mall. I wanted to follow up on my earlier post about two proposed projects, one at Highland and Selma and the other at Highland and Franklin. Together these developments will bring over four hundred new residential units to an already crowded corridor. But the problem isn’t just on Highland. As anybody who lives in the area knows, traffic on Franklin is also pretty damn bad. Highland is a major thoroughfare that is primarily commercial north of Melrose. From Highland to Cahuenga, Franklin is completely residential, and has only one lane running in each direction. Twenty years ago, this was not a problem. These days, though, Franklin is carrying much more traffic than it was designed for. 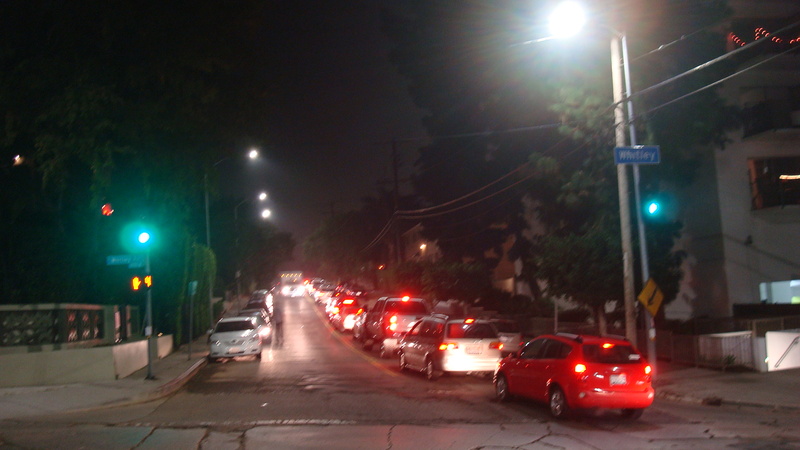 In an earlier post (Hell on Highland, October 25), I talked about the night Katy Perry played the Hollywood Bowl, and traffic was backed up all the way to the freeway. That’s by far the worst I’ve even seen on Franklin. But check out these photos of a couple other traffic jams I witnessed lately. 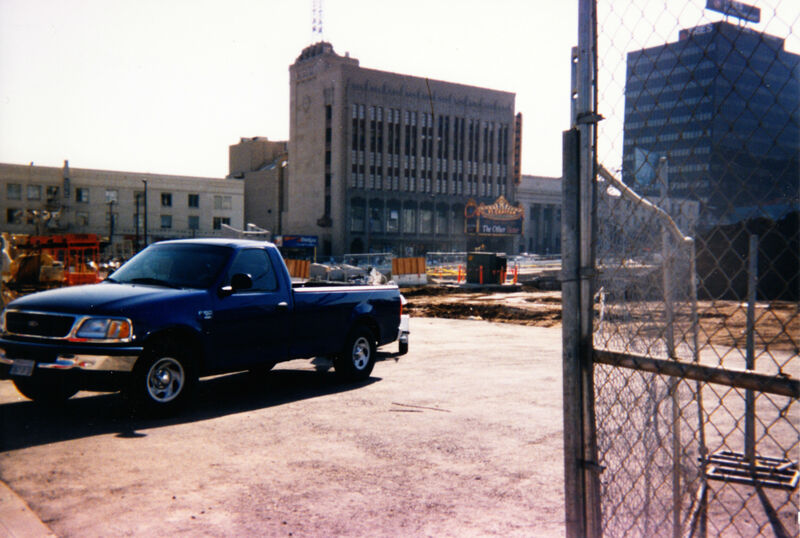 These were both taken at the intersection of Franklin and Whitley…. …shows traffic coming from the direction of Highland. Locals looking at these pictures are probably saying, Big deal. It’s always like that at rush hour. But these weren’t taken at rush hour. These were taken around twelve thirty am. A car had stalled near Grace, and a steady flow of westbound traffic kept drivers from getting around it. …was taken as I was approaching Las Palmas. Pretty nasty for a Saturday morning. Now in this case, one of the left turn lanes at Highland was closed. Not sure why, but it may have had something to do with the fact that Hollywood was closed at Highland that morning. Now in all three cases I’ve mentioned, there are unusual circumstances that caused the back-up. A concert at the Bowl, a stalled car, a closed lane. 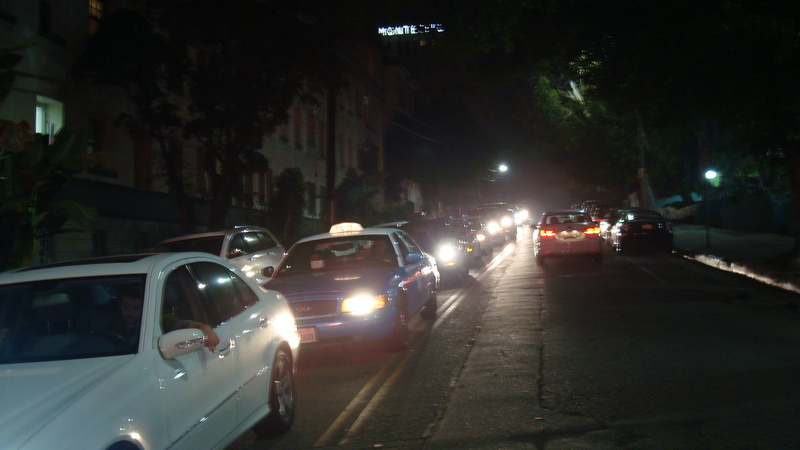 But it shows that it doesn’t take much to turn this residential street into a sea of brake lights. Franklin is already carrying way beyond the capacity it was designed for. It amazes me not only that the city wants to add to the congestion, but that they have determined that the two new complexes mentioned above will have no significant negative impacts. Again, if you disagree with the city’s finding, if you think Franklin is maxed out as it is, please let the City Council know how you feel. 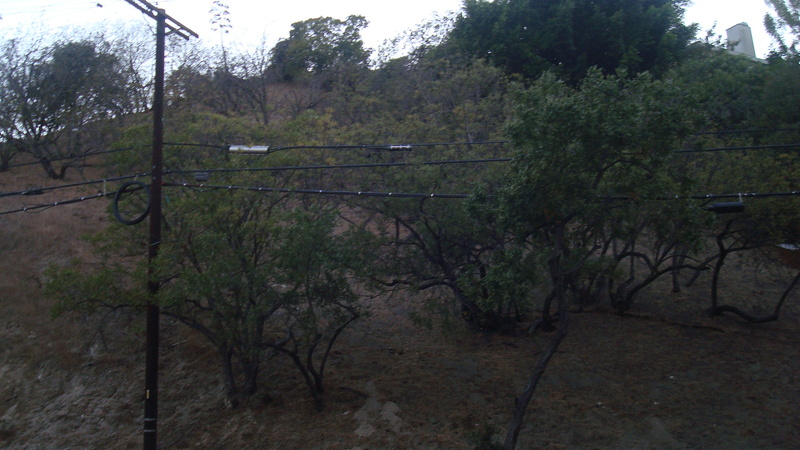 The hillside opposite Harvard Westlake school that will be removed if their planned project goes forward. 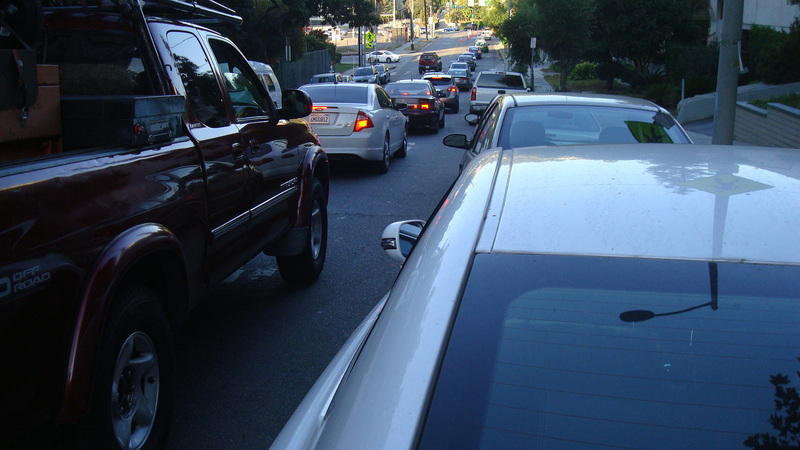 Isn’t traffic on Coldwater Canyon bad enough already? Because of LA’s unusual geography, there are only a few corridors that drivers can use to go from the city to the valley and vice-versa. Coldwater is one of those roads. Originally a quiet ride through a scenic canyon, in the last few decades Coldwater has become a major route for commuters going to and from work. 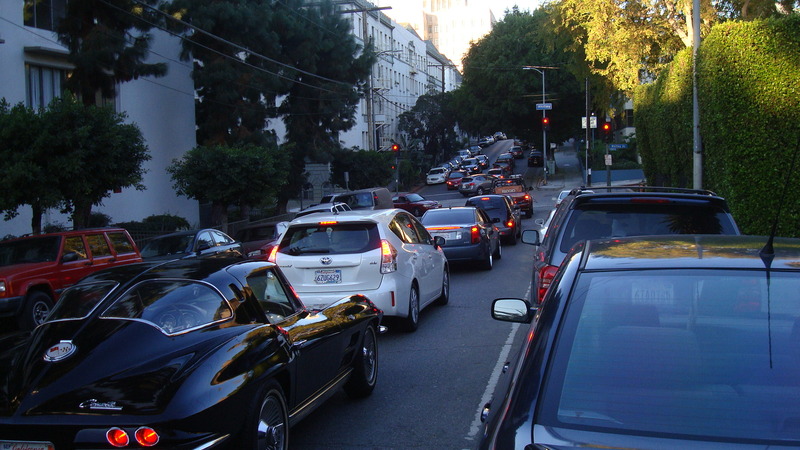 Under ordinary circumstances, congestion is a problem during the work week. But for several months now the back-ups have been worse than usual because the DWP has been replacing an aging pipeline. Residents of Sherman Oaks and Studio City are understandably frustrated. Now the Harvard Westlake School, which is located on Coldwater just a few hundred yards from Ventura Blvd., has decided it wants to expand. They have let the community know that they plan to build a three level parking structure on the hillside directly opposite the school. On top of the parking structure will be a playing field, illuminated by powerful lights during night games, and a pedestrian bridge to connect that structure to the school’s main campus. As you might imagine, local residents are freaking out. Traffic is one concern, but just as important is the damage this project will do to the environment. In order to build the parking structure, the school will have to remove a large chunk of the hillside, including scores of trees. If you want more detailed information, follow the link below. At this point the Draft Environmental Impact Report is being circulated. The City of LA will be accepting comments on the DEIR until Nomember twenty fifth. Also, the Studio City Neighborhood Council will be meeting on November seventh, and they will hear comments from the public at that time. But I would imagine that there are a number of people who live outside of the immediate area that might be concerned about the traffic and environmental impacts. If you think this plan is unacceptable, please contact your city council rep and tell them so. Click on the link to access the city council directory. 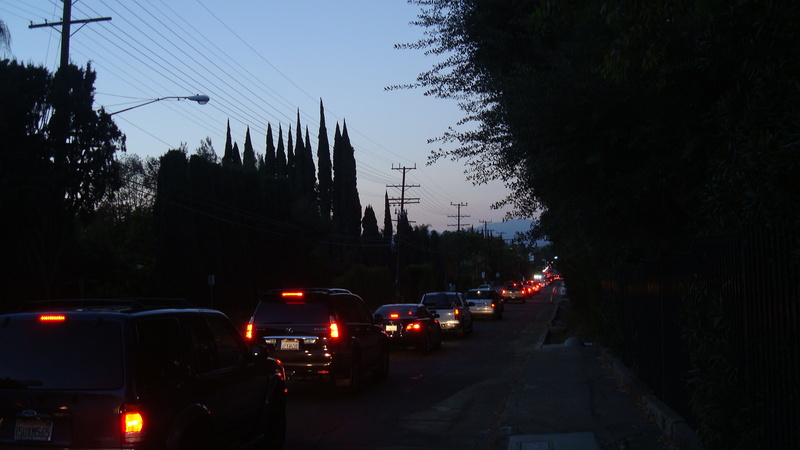 Traffic on Coldwater Canyon heading towards Ventura Blvd., just after six pm on a Wednesday evening.